After receiving a letter from beyond the grave, Carla Crale believes her mother, who died in prison, was wrongly convicted of her father?s murder. In a passionate attempt to clear her name, she persuades those present on the day of her father?s death to return to the scene of the crime and ?go back? 15 years to recount their version of events. An unusual take on the traditional murder mystery, the action of the play slips seamlessly from past to present, examining the danger of relying on personal testimony warped by time, prejudice and perception. By studying each suspect?s testimony, and the various inconsistencies between them, the drama arrives at a disturbing and terrible truth. 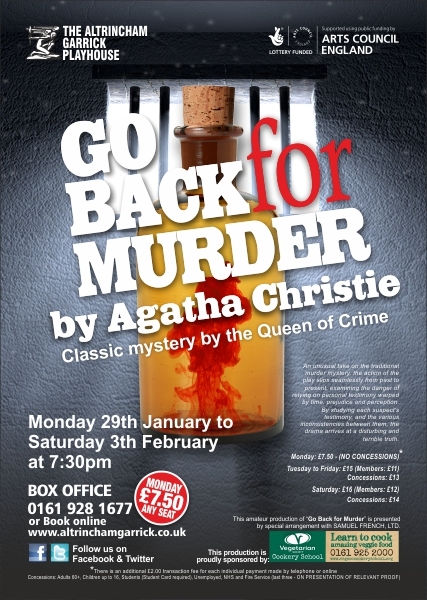 ALTRINCHAM Garrick will have your mind buzzing all week after their production of Agatha Christie?s Go Back for Murder. It is well named because lead character Carla takes us back 20 years as she tries to prove that her mother, who died in prison, was wrongfully detained for her father?s murder. During the slightly slow first Act, Carla, with the help of a solicitor, Justin Fogg, addresses the witnesses from the original trial. Each interview takes the form of a duologue between Carla and a witness and is a good way of registering each character with the audience. After the interval, the protagonist manages to arrange a semi re-construction of the murder scene. Parissa Zamanpour who plays Carla with an immaculate Canadian accent, does a fantastic job of illustrating her determination to clear her mother. In the flashback Lindsey Barker captures the dilemma faced by Carla?s mum, Caroline, at the time of the murder. Anthony Morris is effective as Justin Fogg and Christine Perry?s governess is credible. Jonathan Black is equally believable as Phillip Blake and Steve Searcy as his brother, Meredith. John Keen, who plays Amyas, the murdered man, is every inch an artist and adulterer, whilst Georgina Goodchild successfully plays both the adult and young Angela Warren, not an easy task. I especially like Fiona Primrose as the femme fatal, Elsa Lady Melksham. She oozes stage presence. She, too, successfully travels back in time. You still won?t know whodunnit until the very end as is Agatha Christie?s way. This production is sponsored by the Vegetarian Society cookery school. Go Back for Murder continues until Saturday. Agatha Christie?s classic 1960 play has been revived with great success by the Altrincham Garrick Playhouse. Before dying in prison for supposedly poisoning her husband fifteen years ago, Caroline Crale wrote a letter to her daughter Carla professing her innocence. Carla aided by Justin Fogg, a young solicitor, persuades those present on that fatal day to return to the scene of the crime to find out what really happened. The two act play, cross cuts between past and present to tell the story. ?At times, it is Christie?s writing which lets the play down, with the first act being a series of duologues retelling events of the past. ?Although the actors might have sped up the dialogue in this, the repetition of expository conversations felt tedious toward the end of the act. ?The second half re-enacts the fateful day as the characters recall events through flashback, voiceover narration and some spot-lit monologues. ?For this reason, the second half had more energy and pace and was undeniably more entertaining. The play, is a classic 1960s Crime Drama and the design team have done a marvellous job of transporting us to the era. The detailing of the floral back drop of act one was really eye catching and set the scene perfectly upon entering this large auditorium. ?Act two began with a fabulous reveal of a stunning naturalistic set of the apartment where the murder took place. ?The use of space was expertly presented with numerous areas for secret liaisons and spying on one another. ?This was a really impressive sight to behold and a joy to watch the actors ?play the stage?. For an amateur production, the acting was fantastic and all of the cast clearly explored their roles through imaginative interpretations. The standout performer of the evening was definitely Parissa Zamanpour, in the role of Carla, Caroline Crale?s daughter. ?Her Canadian accent and subtle reactions, really brought a sense of sophistication to this naturalistic crime drama. ?Zamanpour?s Drama training was on full show as her disciplined performance really lit up the stage, despite being burdened with some drab scenes in the writing of her role. Go Back for Murder will run until Saturday 3rd February at the Garrick Playhouse. ?It is a typical Who Dunnit Crime Drama that will satisfy fans of Christie?s work. There is some wonderful set design, stand out performances and some gloriously fiendish characters. This amateur production of ?Go Back for Murder? is presented by special arrangement with SAMUEL FRENCH LTD.